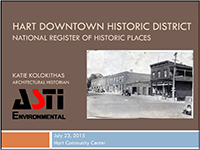 ASTI Environmental is proud to announce that the Hart Downtown Historic District has been officially listed on the National Register of Historic Places as of November 24, 2015. ASTI was contracted by Michigan’s State Historic Preservation Office to complete the nomination for the Hart Downtown District in 2014. After more than a year of community meetings, collaboration with local and state officials, extensive historic research and documentation, the State Historic Preservation Review Board unanimously approved the nomination in September of 2015 and the nomination was submitted to the National Park Service in October of 2015. The creation of a historic district in Hart will have both cultural and economic benefits; it will encourage the preservation of Hart’s historic downtown, spur greater heritage tourism in the area, increase property values, and will create opportunities for buildings owners in the district to obtain Federal Historic Tax Credits for the rehabilitation of their buildings. If you are interested in obtaining Federal Historic Tax Credits for the rehabilitation of a building not currently listed on the National Register of Historic Places or would like to designate an entire Historic District in your community, you can rely on the expertise of ASTI’s team of architectural historians and their history of successful completion of nominations to the National Register of Historic Places, for both single sites and large districts.